Salford 10k this morning. 39:36 and took 20 seconds off my PB. Spindash wrote: Salford 10k this morning. 39:36 and took 20 seconds off my PB. I ran the Greater Cambridge 10k today in 45:21 which in itself is a PB but the course was 160 meters too long and I really wanted to run sub 45. My Strava has me at 10k running 44:41 but it's really wound me up. I guess it's still a PB. They had subsidence on the track and ended up having to change the course and go Garmin distance instead, not sure what that means other than bring 160 meters too long. Today I took my consecutive parkrun tourism run at a different venue streak to 20. Got my 10k official PB today, 49:32. Ran for bloodwise charity, the t-shirts look pretty cool. Well that didn’t go to plan. Collapsed 100 Miles into Spartathlon (153 mile ultra in Greece) at the Mountain Base Checkpoint, was put on an IV drip and then pulled from the race by the medics. It was pretty grim conditions with a Cyclone hitting the course causing torrential rain. Feeling a bit sorry for myself today. Got one more ultra in a few weeks (Thames Trot) which I will aim to plod through and then looking to take a nice long break from ultra events. Avon wrote: Well that didn’t go to plan. Ah that sounds pretty horrible, but at least you're okay. I had a quick look at the results page last night but couldn't see you on there and just assumed the site hadn't updated. My training for the Thames Trot isn't quite going to plan. I haven't been building the distance up quick enough (keep getting niggling pain in feet and knees) and the race has suddenly crept up on me. Got a 20 mile run in today but even at a slow pace it was tough. 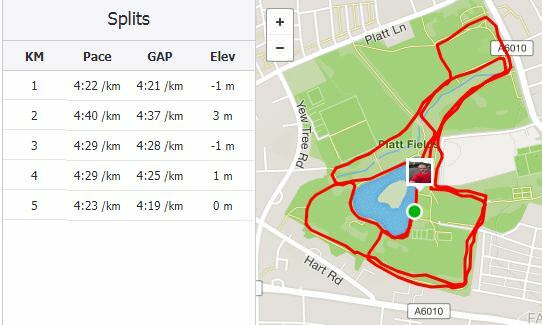 Managed to get around to do Platt Fields park parkrun. I beat my four an a half year record time too. Ive also now done all the Manchester parkruns within the M60. Satrialies, just pulled out of the Thames Trot. Only just recovered from illness and now my body seems to be a bit broken.. have deferred until next year. After running (on average) a marathon or an ultramarathon every month for the past 10 years I think I need a rest! mcjihge2 wrote: Managed to get around to do Platt Fields park parkrun. I beat my four an a half year record time too. Ive also now done all the Manchester parkruns within the M60. I wouldn't go running on busy roads mate. That's quite dangerous. I would wish you good luck, but you'll have finished by now... how did you get on? Had a half marathon of my own this morning - Manchester (which actually takes place entirely in Trafford). New PB of 1:27:08. 1:48:36 Ran the second half faster so it went perfectly to plan, apart from the all day rain! Absolutely buzzing at the moment, feel like a champion! Main goal is just to finish within the 11hr cutoff, but I'd love to finish around 9hrs. We shall see, it all depends on if I can keep walking to a minimum in the second half. Wishing I had done lots more training now. Avon wrote: Satrialies, just pulled out of the Thames Trot. Only just recovered from illness and now my body seems to be a bit broken.. have deferred until next year. Hope you're recovering well. I'm sure you'll be back soon enough stronger than ever, but you've definitely earnt a rest until then! 9hrs 45min. Not too disappointed with that, it was about what I expected. I did get off to a good start, felt great up to 20 miles and was on for 8hr pace. Then between 20 - 35 miles it became a struggle. My quads kept seizing up, forcing me to keep stopping. Feet were hurting bad. And I had some knee pain. It was hard to get into a rythm and when I did it was only at 11:00/mile pace. Once there was only a half marathon remaining I managed to push on slightly. My quads and knees were no longer a problem, but feet were still bad. I tried to keep walking to a minimum, but I was on my own at this point and had to stop and check the map a few times. Running pace was also still very slow, so despite digging deep I wasn't that much quicker in this section. At halfway I had called my girlfriend to tell her I expected to finish around 5:30 - 6:00pm, and ended up finishing at 6:15pm, so despite everything I wasn't too far off and happy with the result. I'm sure I'll be back next year and now have a time to beat! Well done. I struggle with running over an hour. Almost 10 is very good. That's incredible, just to be able to Keep moving is an achievement. Excellent, well done. My entry was deferred due to illness and injury so I’m in for next year. Bought a bike this week so I can start doing some other exercise while I can’t run. Yesterday I did my 200th Parkrun. Which is nice. mcjihge2 wrote: Yesterday I did my 200th Parkrun. Which is nice.